Why do Americans have a tendency to view their society as a classless one? Richard Bushman argues that this classic cultural tendency has its origins in American ideas of “gentility.” Gentility is a set of ideas – with origins in the court culture of fifteenth and sixteenth century Europe – about importance of “refined” manners to cultural and political prominence. A refined person – a gentleman and gentlewoman – processed the proper speech, manners, deportment, and cleanliness which marked them above the masses and fit to rule. Inherited from the English upper classes, Bushman argues that the “refinement of America began around 1690.” Beginning at the turn of the eighteenth century, America’s elite began to consciously emulate the upper classes in England and began building large houses and buying fine china, high-quality clothing, and other markers of refinement. This is a marked contrast to the seventeenth century, where the material lives of the poor, middling, and upper classes were not drastically different in British North America. Beginning after the Revolution and through the nineteenth century this quest for refinement spread into the middling classes where parlors and other accruements of genteel life began to show up. While as a holdover from the Renaissance and aristocratic culture, this quest for gentility and refinement seems, at least, nominally opposed to the two great revolutions of nineteenth century American life – republicanism and market capitalism. But, as Bushman persuasively argues, gentility emerges as a prop to both of those post-Revolutionary transformations. By driving increasing members of all classes to consume “refined” luxury goods, gentility helped expand the appeal of the market revolution and increased the drive of industrialization – all of this despite gentilities origins as leisured ideology of a non-productive class. The quest for refinement helped turn producers into consumers. Gentility – despite its aristocratic origins – also helped prop up republicanism after the American Revolution. Gentility feed into traditional republican ideas of ideas of a “natural aristocracy” that should led the people in a republic. The question face republicans was, how to identify the “natural aristocracy”? Gentility and refinement provided the metric that allowed those fit to rule apart from the rest of the democratic masses. The market revolution and industrialization democratized gentility, making its cultural markers accessible to anyone with the sufficient discipline and wealth to property themselves in the proper way. Thus overtime gentility became “domesticated:” middling and Christianized. This quest for refinement also helped prevent clear cultural class divisions from emerging in the new United States, for if gentility was accessible to all – based on one’s character – there were only two classes the refined and those aspiring to be refined. Gentility left Americans imagine themselves as a society with no bottom rung. Bushman is best when presenting his evidence through changes in material culture – hence his subtitle of cities, houses, and persons. In some ways Bushman sees himself short. He fails to emphasize just how much gentility was (and perhaps is) glue that holds many aspects of American ideology together; capitalism, domesticity, and republicanism. While Bushman shows how genility propped up each of these elements, he does not always high how it was also the connective tissues that tied sometimes-opposed elements of American culture together. The elements of this argument are there but not always clearly laid out. TIE-IN: This books links up extremely well with Jim Horn’s Adapting to a New World. Bushman’s narrative picks up directly after Horn’s and highlights the continuing influence of European cultural norms to New World society. Although not explicit within Bushman’s narrative, the process of refinement was also a process of further Anglicization in the American colonies and (later) the new nation. Jon Butler’s Becoming America, of course, provides a counter argument. 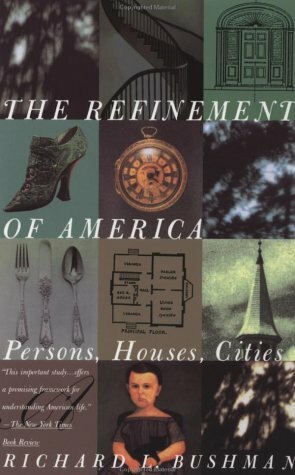 Richard L. Bushman, The Refinement of America: Persons, Houses, Cities (New York, NY: Random House, 1992), xii.